I define frugality as getting the maximum value for your dollar while living squarely within your means, which is a pretty reasonable definition. I wouldn’t expect someone making $15,000 a year that doesn’t sweat what they eat to make the same food choices as someone making $50,000 a year who highly values the quality of their food, for example. The person with more income might have a “bang for the buck” that includes organic milk and farm-raised eggs, for example, while the other person won’t care and buys the least expensive milk and eggs at the store. Both are fine, because both have resulted from a personal realization of what’s valuable in their life and an effort to seek the best value for their dollar with those personal values in mind. Take me, for example. I’m much closer to that person who makes $50,000 a year and puts a lot of personal value into food. For me, there is added value in seeking out farm fresh eggs, the kind that have a rich yellow yolk that bobs up way above the egg white. There is a big added value for me in buying milk at a premium directly from a local producer, where I can watch the cows grazing in the field eating fresh grass and I can see that the cattle aren’t being given hormones to drive milk production. At the same time, the only factors that I personally value in cars are reliability and fuel efficiency, as long as the car has enough size to seat my six-and-a-half foot frame. Nothing else really matters to me at all – I don’t care whether the car is upscale or economy, new or old. 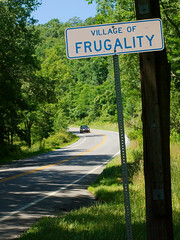 This brings me back to the idea of sacred cows – dogmatic ideas that some people believe must be followed if you are to be considered “frugal.” If you don’t follow these ideas, you must be wasting your money. I think the idea of such sacred cows are stupid and limit the options for finding the best value for people. Here’s an example of what I’m talking about. If you’re buying a car, many frugal people believe that the discussion begins and ends with cars that are at least three years old. If you even consider anything else, you’re throwing money away on depreciation and you’re, flatly, an idiot. That perspective is very limiting and sometimes draws you away from the best value. Let’s say, hypothetically, that I’m about to replace that incredibly fuel-inefficient 1997 Ford F-150 that sits in my driveway with a van to haul my family around. I have enough cash in the bank to simply pay for the new vehicle, so the danger of a loan isn’t a factor, either. Now, a “frugalista” might say that I should start shopping around for used vans and look for the best deal on used ones, sell my truck, then put together all of the cash and buy the vehicle. Clearly, that’s one approach. I did some research and I found a used 2003 Toyota Sienna with about 80,000 miles on it for $10,200. Since my truck is an utter rust-bucket with almost 200,000 miles on it, I might be able to get $1,000 out of it with some footwork, meaning my cash outlay for that vehicle (after negotiation) would be about $8,000. But simply subscribing to that philosophy leaves out an option that’s at least worth consideration. My F-150 qualifies for the “Cash for Clunkers” program, which equates to a $3,500 voucher on a new vehicle. A new Sienna is $24,000, but also has a $1,500 discount on it and, with negotiation, I can get the price down to $22,000. Thus, my cash outlay for the vehicle – with 0 miles on it and a warranty covering all repairs up to 100,000 miles – would be $18,500. The $10,500 you would pay for the first 80,000 miles (as compared to the other option) would be the most reliable miles (meaning no uncomfortable breakdowns at inopportune times), plus those miles are covered by warranty. I’m not saying that the new Sienna is the best deal, but what I am saying is that it’s at least good enough to carefully consider and to subscribe to the dogma that one absolutely must buy used is not good. Doing so can cause you to miss a real value. Similarly, many people will jump in and say that I wasn’t really looking for the best “deal” when I’m shopping for a van because I didn’t bother to look at vans with poor reliability data. And that’s true – my focus is on vans with strong reliability data from Consumer Reports, and that means my focus is first and foremost on Honda Odysseys and Toyota Siennas, with a few other models trailing behind and other models that make me shudder. But, remember, my value with buying a vehicle is reliability. I don’t care about leather seats or stow-and-go seating or a drop down DVD player or any of that stuff. All I want is a vehicle that’s not going to die along the side of the road, and I’m willing to pay more for a vehicle that’s more reliable on average. That, to me, is frugality at work. I know what my core values are and I seek out the best “bang for the buck” with regards to those values. Doing that with both eyes open causes me to consider things that violate the “rules” of frugality. And, frankly, I don’t care – I’m finding the best value for my own situation, not yours. Another example of how sacred cows can be dangerous comes from buying generics. According to the old rules, buying anything other than generics is a complete waste of money and the coupon sections in newspapers are a scam to trick you into buying overpriced household goods unless they’re huge coupons that get the price down below that of a generic. A while back, I wrote (fairly controversially) about using cheap garbage bags. What I found is that using the generic garbage bags resulted in bags ripping and food all over my kitchen floor. I wound up buying name brand bags (and using coupons and bulk buying techniques to get the cheapest price per bag) because those bags didn’t break on me. For me, it’s not a “bargain” if you wind up with food all over your kitchen floor, even if that is the cheapest bag. I have a similar issue with window cleaners, but in a different way. I’ll take out a squirt bottle, put in two cups of water, three tablespoons of vinegar, and half a teaspoon of dish detergent, swirl the bottle, and get to work. This cleaner costs me pennies and does the job – so why would I ever go to the store and buy it? My core value here is whether or not it gets the window clean (it does) and whether or not there’s a big time investment getting there (there isn’t). I follow a similar logic with my homemade laundry detergent and with cooking at home. Once you start looking at frugality through the lens of “getting the maximum value for your dollar while living squarely within your means” and you consider what you actually truly value (and that means a lot more than money), many of the tired old dogmatic rules start to fall away. Yes, they still work as a good starting point, but when you start throwing out any idea that doesn’t subscribe to dogma, you’ll find yourself missing out on opportunity after opportunity to maximize value in your life. A final note: this kind of absolutism invades anything people are passionate about. There are “absolute” rules about food, about any hobby you can imagine, about clothing, about exercise, and so on. Most of the time, those “absolute” rules are exactly what they are for frugality – they’re nice starting points, but if you make them your ending points, you’re limiting yourself and your perspectives.